How to secure communication between two sites connected to the Internet? Use Site-to-Site IPsec VPN tunnel between two Huawei routers. IPsec VPN is an open standard protocol suite, defined by the IETF in the following RFCs: 2401, 2402-2412, 2451. IPSec is a widely used protocol for securing traffic on IP networks, including the Internet. IPSec can encrypt data between various devices, including router to router, firewall to router, desktop to router, and desktop to server. How to configure IPsec VPN using Huawei CLI? Let’s assume that we have two sites, Site1 and Site2. Both sites have PCs connected to the LAN network, PC1 and PC2 respectively. The sites are connected through WAN network (in our case labnarioR2 router simulates WAN). We want to secure communication between PC1 and PC2. To do so, we have to configure IPSec VPN tunnel between both sites. In our case tunnel will be established between labnarioR1 and labnarioR3 routers. Both routers will be responsible for data encryption and decryption using specified algorithms. IKE for key exchange and SA establishment. Traffic encryption/decryption will be done on both, labnarioR1 and labnarioR3 routers. So I have to configure those two routers, to be able to establish IPsec VPN tunnel. 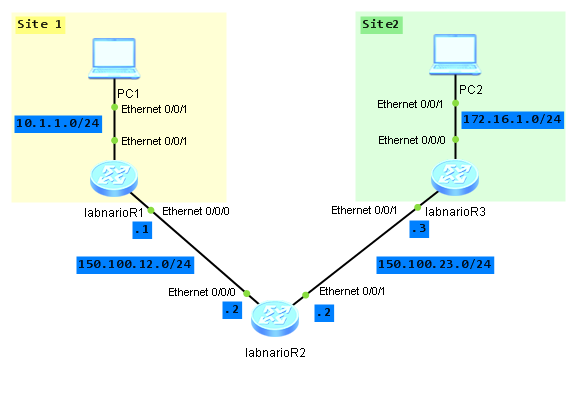 LabnarioR2 router simulates WAN cloud. It has nothing to do with IPSec. Do not forget to provide IP connectivity between routers and PCs. This is omitted here. Encryption and authentication algorithms (as mentioned above, SHA1 and 3DES respectively). To bring IPsec VPN tunnel up, IP traffic should be generated between PC1 and PC2. To do so, just ping PC2 from PC1 or vice versa. Let’s verify if our tunnel is up. As you see, IPsec statistics look a little bit strange. This is because these commands were done on eNSP. It looks like IPsec is not working on eNSP even though there are all configuration and display commands. When tested on AR19 routers, everything was fine.